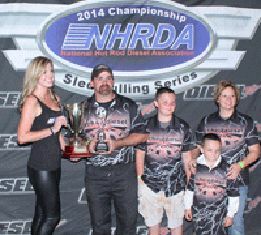 After Brad Ingram won the 2013 National Championship in the 3.0 Class he decided to step up into the Super Stock Class in 2014. Over the winter he transformed his truck so he would be competitive in Super Stock Class. All season long it was Ingram and his good friend Brad Deeter that battled back and forth for the lead in the National points as they both attended events in Texas, Missouri and Indiana. As we headed to World Finals Ingram was only 2 points behind Deeter in the points chase and Ingram knew he would have to have a strong showing to take over the points lead. Brad Ingram drew the number 3 position out of the 6 competitors in his class. After watching the first 2 pullers Ingram made some last minute adjustments and pulled it out the back door with a 340.05 foot pull and Brad not only won the National Championship but also Title of World Champion.